Skill system can be accessed at the bottom of your screen or by click on "K" keyboard. To unlock new skills you have to reach specific level along with having the required amout of Amethyst to unlock them. 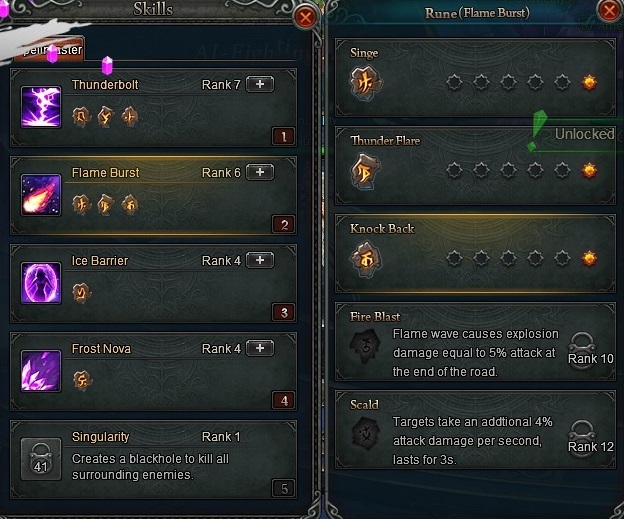 After opening Skills interface you will see Rank of skill along with "Runes" of specific skill. After you rank your skill high enough higher rune will be available for you. E.g. 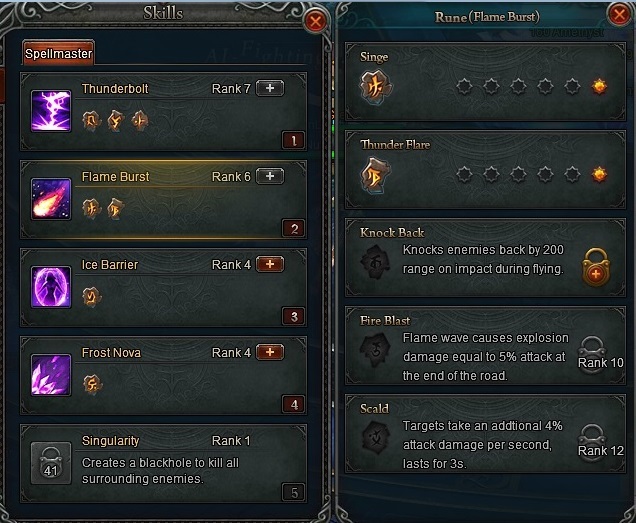 Flame Burst is at Rank 5 and new rune unlock at Rank 6 of this skill. So Simply press the buttom "+" on this skill to increase its rank. All you have to own is the rewuired amout of amethyst to unloc new rank for this skill. We have upgraded Flame Burst to Rank 6. Now to unlock Rune "Knock Back" press buttom of "+" which has lighted up. 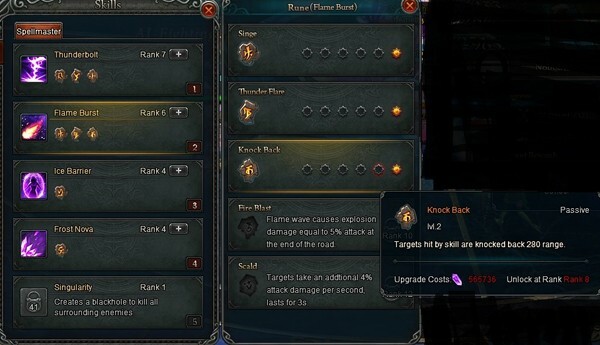 Now you have unlocked the new rune for your skill "Knock Back" which was added to the Flame Burst as smaller pic under this skill name. 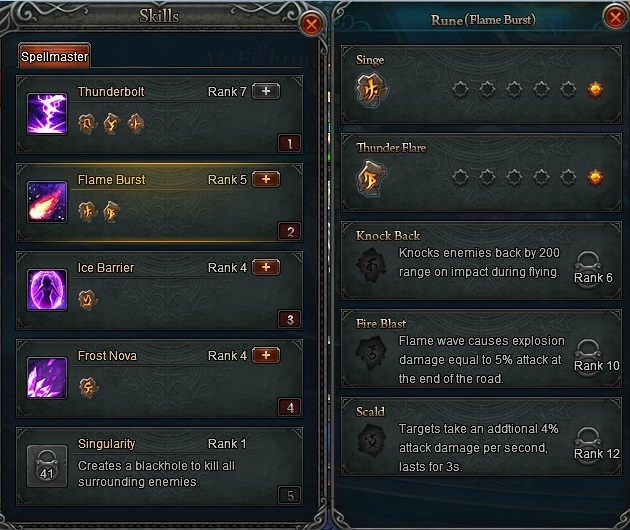 This means that rune is active and can be triggered when you trigger this skill. You can also upgrade level of your runes. As shown on picture above you have to get your skill of Flame Burst to lvl 8 and gain 565,736 Amethyst to upgrade rune effect. You can upgrade each of runes stat 6x (Max). To cast a skill (inside of battle/dungeon or non system battle) you can click on "Auto-Mode" and your main chracter will use skills directed by our system, but if you wish to play manually you can click on the skills on the screen or push 1/2/3/4/5 Q/W keys on keyboard to activate them. Each of the skills consume MP (which is shown on the picture) MP is gained automatically. When you enter new battle it does not matter that your MP narly reached 0 at previous battle/dungeon at new battle/dungeon your MP will be refilled to 100%. Skills are gained as you level up. The more you level the more skills will be unlocked to you. Please be aware that even in battle there is cooldown on skills. So use them wisely or you will end up with all of your skills cooling down not being able to attack! (Expect skill 1 which has not cooldown).